An intelligent breed, this dog does well in hunting sports. A gentle breed that is very obedience and very eager to please. Alert, lively, and independent, this breed is overall good-natured. 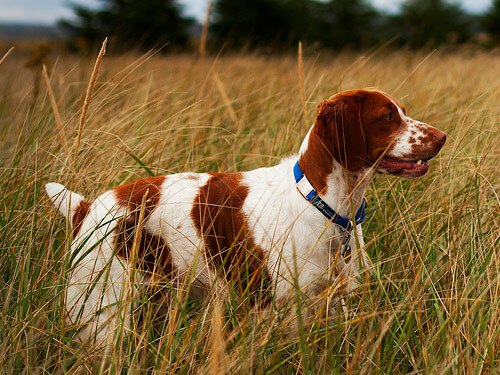 The Brittany Spaniel is generally good with children and other pets if socialized properly throughout puppyhood. The Brittany Spaniel loves water. Described as a very friendly and loyal companion, this dog also does well in a country environment. Originally bred for hunting, this breed has natural protective instincts. This breed is considered a very popular companion dog. Happy and alert, this breed has a great presence. Easy to handle, and affectionate, this breed would make an ideal house pet if given the right care and exercise to keep him happy. This breed requires a gentle, yet somewhat firm hand, as they can be hyperactive. A relatively light shedding breed, this dog does require regular brushing to keep coat from becoming matted. Bathing once a month is recommended. Some trimming is necessary if to be used for show. Silky, feathered beautiful coat is medium length and does not require much maintenance. Colors accepted are Orange and White, Liver and White, Black and White, Liver tri-color, and Black Tri-color. As this breed is rather hyperactive, they can become bored easily. Consistent training and a firm hand is recommended to keep you and your spaniel happy. This free thinking breed responds well in hunting or retrieving sports and is easy to train. A medium sized yard is a must for this rambunctious breed. This breed has plenty of stamina to keep you on your toes and does require regular exercise. Would do best in a home with at least a medium sized yard, and an active owner.